The Mystery Schools are the most easily documented of the ancient adherents of occultism. They were the caretakers of this esoteric (hidden) knowledge. These schools formed the nucleus of the religious practices of ancient nations and empires such as Egypt, China, Chaldea, Persia, Greece, and Rome, as well as the Aztec and Inca civilizations. Only the priests and adepts (who were initiated through various grades or levels) gained insight into these hidden 'truths' of the universe. These human adepts participated in Satanic religions with the sole purpose of becoming possessed by the Familiar Spirits behind this Mystical Religion, and the development of psychic abilities and spiritual healing techniques. This Satanic power is REAL and POWERFUL, capable of overcoming any human resistance unless the human is already empowered and possessed by the Holy Spirit. The Theosophical Society was started in 1875 in New York City by Helena Petrovna Blavatsky (a Russian Channeler) and Col. Henry Olcott, an American occultist. Theosophy concentrated on the development of occult powers within the individual rather than concerning itself simply with contacting the dead. 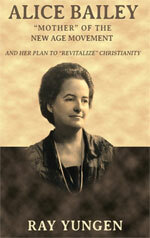 In the early twentieth century Alice Ann Bailey became the global head of Theosophy. I discovered, first of all, that there is a great and divine Plan . . . I discovered, for a second thing, that there are Those Who are responsible for the working out of that Plan and Who, step by step and stage by stage, have led mankind on down the centuries. Alice had her first contact with a voice that claimed to be a master in November of 1919. Calling himself the Tibetan, he wanted Alice to take dictation from him and publish the material into books. Between 1919 and 1949, by means of telepathic communication, Alice Bailey wrote nineteen books for her unseen mentor, named only Master D.K. he significance of the Alice Bailey writings has heralded anticipation of the appearance of a World Healer and Savior in the coming Aquarian Age. This savior would unite all mankind under his guidance. Bailey termed him the 'Coming One.' This person was not to be the Lord Jesus Christ, of whom Christians await the return, but an entirely different individual who would embody all the great principles of occultism, chiefly the divinity and perfectibility of man. This Savior will fulfill prophecies of Antichrist. We need to sit up and take notice that Alice Bailey's religion has now come to the forefront of mainstream society. What this means according to those who are sympathetic with this is that if we are to be 'spiritual', we need to partake of Alice Bailey's 'new vital world religion'. The Biblical Antichrist is at Earth's Portal, and Alice Bailey has set the stage for his appearance.